"Little Lake" or Lake Oloidien if you go by the map. Oh, well, *now* I find out that not only do rock scorpions exist, they live in AFRICA and they have the LONGEST RECORDED BODY LENGTH OF ALL SCORPIONS. How did my brain know that and why did it feel the need to terrify me with it all night? Also, there were HIPPOS. EATING. OUTSIDE. And they are horrible, horrible animals. I heard them crunching grass all night long and had we not been in the upstairs unit I probably would have peed myself in fear. Why oh why oh why did I have to find out that hippos are lightning fast and will eat you to death? I could have gone on in life thinking they were like giant harmless water cows. Thanks a lot, Africa. Finally, my stomach hurts and my legs are sore and my blisters look like freshly butchered domestic animal intestines. We have a bumpy ride ahead of us this morning, on our way to the next piece of this epic journey, a 3 day Christmas with the Maasai in the village that David is from. I am taking a concoction of pills to put me in a zone where I don't register potholes anymore. We stopped at a soda lake which is, if I'm not mistaken, called 'Little Lake' (descriptive!) The exciting thing here is flamingos. I cannot explain it, but since I was little I referred to 'The Blue Danube Waltz' as 'Flamingo Music.' It's rather fitting, isn't it? 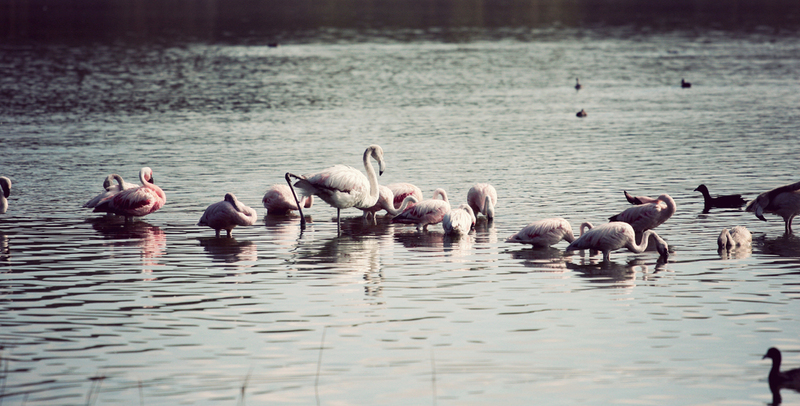 I imagined Johann Strauss II conducting on the lake edge while groups of flamingos did their funny flamingo dances. That also could have been the combined effect of 3 different kinds of pills at work. Either way, it was inspiring. I slept pretty much the whole way to the village. We stopped in Narok, the closest town, and had some coffee. We did this to stall for time, as the camp had gotten flooded the night before because of heavy rain. I think we were all nervous, especially when David pointed out 'option B' along the side of the road - a small, rather dubiously constructed motel. Appearances could have been deceiving but I won't lie, I was pretty relieved when we got to the camp and everything looked relatively dry. The camp is not like I expected at all! I thought we were going to actually be in David's village but we were on his land a few kilometers away. It was our own private camp, with tents set up with fold-up beds, warm sleeping bags, solar powered lamps, two tent-out-houses, A BUCKET SHOWER (more explanation coming) and a special kitchen tent with a professional chef. When we got into the camp we were immediately served lunch; it was probably the best lunch I have had so far. Salad greens with balsamic vinaigrette, goat cheese, and walnuts; pasta with turkey, and a dessert of caramelized pineapple. One: it was just nice not to be at a buffet; two: everything was prepared so amazingly well! ; three: IT WAS SO DELICIOUS. We met Merry (David's wife) and two of David's sons, Morani and Tim. They were absolutely delightful. The Maasai appear to have perfected child-rearing to the point where I am considering straight up sending any future children to be boarded in a village around here. We went for a short afternoon walk; the weather had been beautiful all day but dark clouds were rolling in and we got back to the camp just in time. It started raining but not very much. We drank coffee and sat around the campfire, and in general it was a super cozy feeling. *interesting side note* Scorpions are scientifically classified as troglodytes.